Length: Various loops of 1.5, 3.8, 4.5, 5.6, 5.9 and 7.0 miles. Location: From the intersection of Highway 45 and County Highway K, continue east on County Highway K approximately ½ mile to the Town Park. This 1.5 ski trail via access at the Conover Town Park (which has picnic tables, a playground, ADA accessible heated bathrooms and a plowed parking area in winter) is connected by a newly created .6 mile connector to the Pioneer Creek Trail system offering additional trail loops for cross-country skiing. 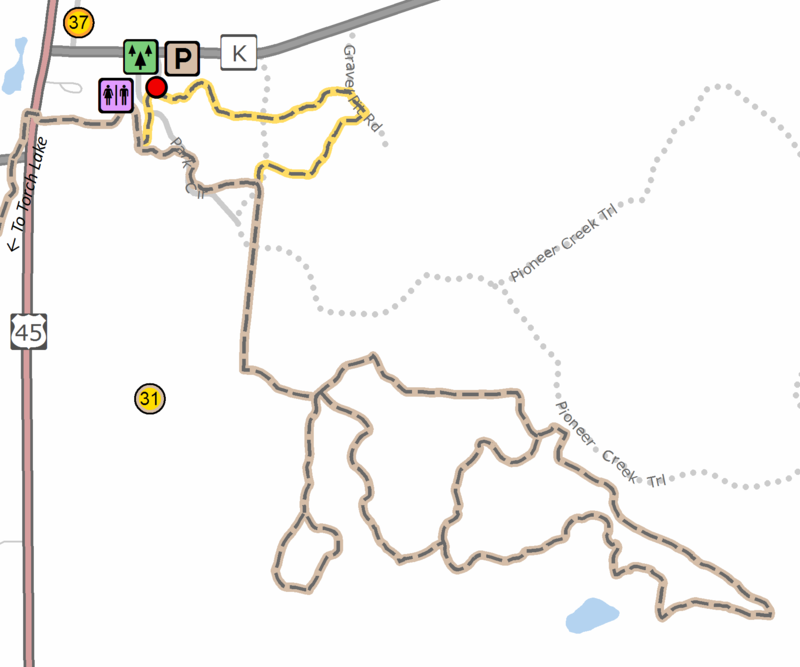 The trails are mostly rolling hills for novice and intermediate ski level (some steeper hill climbs at the gravel pit road and the two-way trail to Pioneer Creek Trail). The trail loops pass through a variety of forest types such as young jack pine, aspen, oak and large white pine. Trail will be groomed weekly or as needed. During non-snow seasons, these loops, along with other loops, are open for hiking and hunting with several entry points accessible for disabled hunters. Additionally, several loops of this system are open to equestrian riding via a connector trail from the Torch Lake Loop of the Equestrian Trail System to create almost 20 miles of signed equestrian trails. Additional trail enhancements are planned.